The Ejercitos of Pagsanjan are hoping that the Pacquiao magic would help them in the May elections. 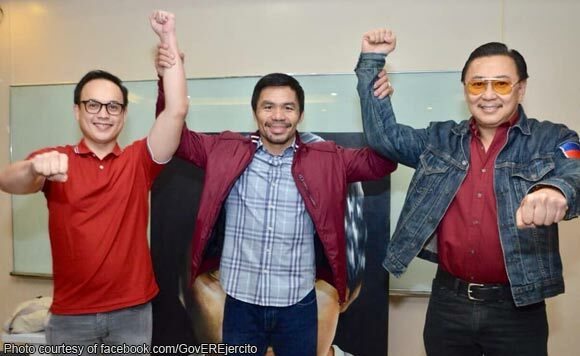 In a Facebook post, former Laguna Gov ER Ejercito shared a photo of himself and his son Councilor Jet Ejercito getting the endorsement of boxing superstar and Senator Manny Pacquiao. ER is hoping to return as governor, while Jet is running for Pagsanjan mayor. Will Pacquiao’s backing knock out their opponents? “SENATOR EMMANUEL “MANNY” PACQUIAO HIGHLY ENDORSES PAGSANJAN MAYOR JOHN PAUL “JET” EJERCITO AND LAGUNA GOVERNOR EMILIO RAMON “ER” EJERCITO👊🇵🇭March 2, 2019👊🇵🇭Photos by: Roy Tomandao,” ER posted on Facebook. Netizens score Boying Remulla over FB posts on Wow Pilipinas party-list: Pakiuna ‘yung PITX! Mayor Lani Mercado-Revilla asks: Boxing or Cooking Show?